The Yankees just can’t seem to catch a break this season. 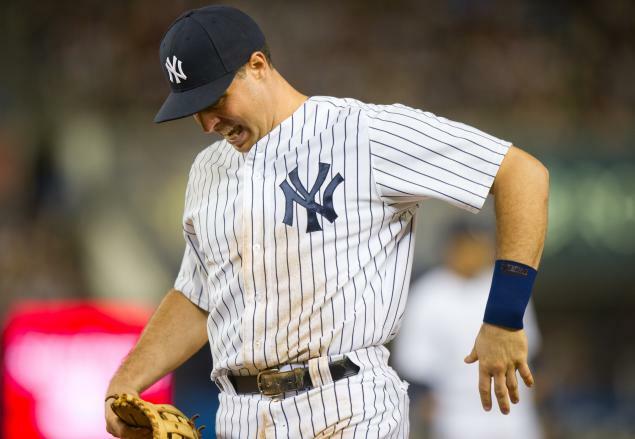 In a story that seems to be happening all too often this year, the Yankees are sending two more to the DL, Mark Teixeira and Kevin Youkilis. Teixeira has inflammation in the same wrist that cost him to miss the first 53 games of the season. No one seems to have a definite answer as to just how serious the injury is. There have been mixed reports that he will just miss the 15 days while on the DL, while others are speculating that it could be much worse and ultimately need surgery to repair. You could tell in the short time Texeira was back that he was not back to full health and something was bothering him. He just never looked comfortable at the plate and Kevin Long went as far to say that he looked like” a shell of himself”. In the 15 games he returned for, he was batting just .151 with 3 home runs and 8 RBI. Not exactly the production the Yankees were looking for when he was activated. This means Lyle Overbay will return to the starting line up for the foreseeable future. Overbay has filled in quite nicely but the Yankees have to fear that they have already gotten the best of what Overbay has to offer this year. The Yankees are holding their breath that his inflammation will go away sooner rather than later, as the Yankees will need him to make any real noise this year. Kevin Youkilis has been diagnosed with a herniated disc and will require surgery causing him to miss the next 10-12 weeks, if not the year. Youkilis was expected to fill in at third base until Alex Rodriguez was able to return and give Mark Teixeira days off from time-to-time at first. Early on it appeared this was going to be a great pick up, but that quickly changed as he has been nagged by injuries all year. This means David Adams will see the majority of playing time at third until A-Rod is able to return, and who knows when that may be. Adams is only 26 years old, so this will be his real shot to make an impression on the organization that he can be apart of the team’s future plans. I don’t know if it will be for the Yankees to hold it together if injuries to continue to plague them at this rate. It has been a real challenge thus far and a true testament to Joe Girardi and Brian Cashman for the job they have done. But unless these injuries stop and players are able to return to health for longer than a week, this team will not be able to make a real run at a championship.